It’s been all but confirmed that the little HP Veer is coming to AT&T, and it even looks that thanks to its HSPA+ radio, it will be marketed as the Veer 4G. 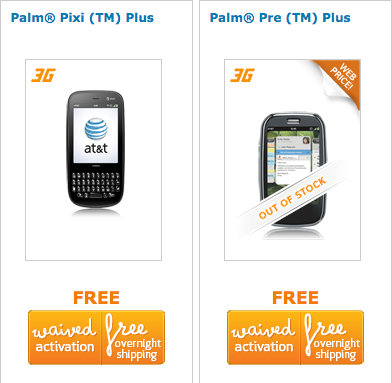 And as if AT&T were clearing room for the Veer, the bigger, older, and slower Palm Pre Plus has gone out of stock on their website (though refurbed Pre Plus phones are still available). Strangely, the Pixi Plus is still in stock at AT&T, as that’s sort of the device the Veer is angling to replace. Then again, the Veer has more in common from outward appearances with the Pre than the Pixi. Either way, it’s out with the old, and in with the new. Eventually. And a quick update on the other carriers: the only webOS phone on Sprint is the Pixi, which is free with a contract, while Verizon has just the Pre 2 going for $79.99 on a two-year contract. When either of the two will be getting a new webOS device (like that world phone CDMA + GSM Pre 3) is still a big unknown. Source: AT&T; Thanks to Rowdy for the tip!